Caption: Top: Image from NASA’s Spitzer Space Telescope of galaxies NGC 2007 and IC 2163. NASA scientists tell us that two "colliding galaxies" in the constellation Canis Major are responsible for the amazing, mask-like structure shown here. But experts in plasma discharge might suggest a different conclusion. In a supposedly expanding universe still rushing outward from the Big Bang, one would think that the vast reaches of space are an unlikely place for "fender-benders." Yet the word "collision" is extremely common in scientific press releases these days, as astronomers grasp for explanations of galactic events in faraway places. It is gaseous collisions that generate the X-rays, radio waves, and synchrotron radiation detected throughout the cosmos, they tell us. The picture above shows the galaxies NGC 2207 and IC 2163 in the constellation Canis Major in what astronomers are calling a "cosmic smash up." The structure's unique appearance has led investigators to dub it “The Galactic Mask”. 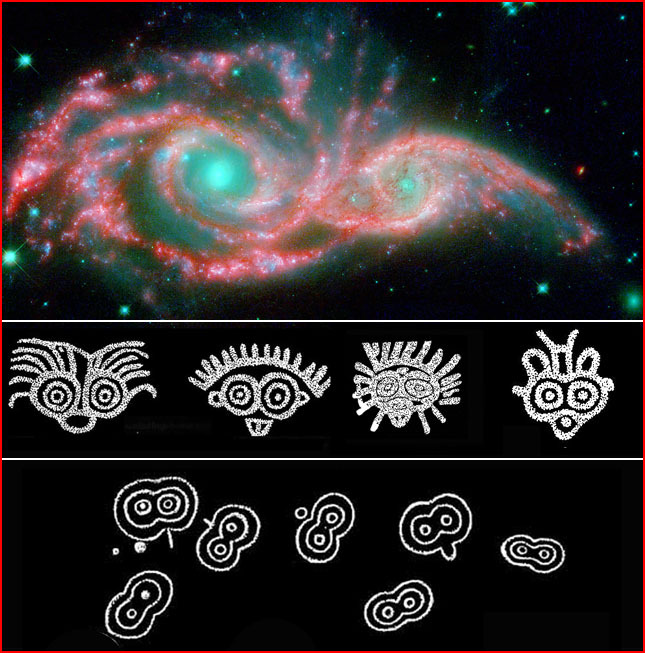 They say the mask's “eyes” are the galactic cores, and its "feathers" are the galaxies' star-filled spiral arms. Vassar College astronomer Debra Elmegreen, the lead author of a paper on the observations, said of the image: "This is the most elaborate case of beading we've seen in galaxies..."They are evenly spaced and sized along the arms of both galaxies." MSNBC's Cosmic Log website, describing the scientists' observations, tells us that the bead-like structure of the spiral arms is caused by "gravitational pressures (squeezing) gas and dust into new clusters of stars." "To form a black hole that's outside the disk of the galaxy is a real surprise, if in fact that's what it is," said one of the research team's co-authors. Experts in plasma discharge phenomena will use a much different language to describe the image. For decades, advanced research into plasma discharge instabilities has documented formations precisely matching galactic structures seen in space. As noted in an earlier TPOD, “Plasma Galaxies,” plasma scientist Anthony Perratt, using particle-in-cell computer simulations, has demonstrated the evolution of galactic structures under the influence of electric currents. Through the "pinch effect", parallel currents converge to produce spiraling structures. Dual, interacting currents can, in fact, present an appearance surprisingly similar to that of the twin eyes in the “Galactic Mask” seen above. Laboratory discharge experiments have documented all of the features of the “Galactic Mask” above. Indeed, the very words used in the article could have been taken from the lexicon of plasma scientists describing plasma discharge instabilities: “string of pearls,” “beads on a string,” “feathers,” and “mask.” In plasma discharge terms, the evenly spaced “beading” along spiraling arms is a perfect example, but of the “pinch effect” that, in plasma cosmology, gives birth to stars. In a more familiar setting, the same plasma pinch produces the oft-observed beading of lightning. On the other hand “gravitational pressure” supplemented by imagined “black holes” placed wherever energies are too high to be explained through old-fashioned gravity, can offer almost nothing to test scientifically. How, then, can the theories ever fail? 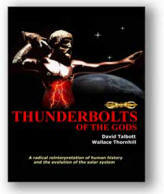 The explanatory power of plasma discharge becomes even more interesting when one begins to consider new evidence that our early ancestors witnessed strikingly similar high-energy plasma discharge in the terrestrial sky. The rock art images above are from North America (first row) and Easter Island (second row). Innumerable counterparts occur around the world—all presenting a common pattern that would seem to mock natural experience: disembodied, often “hairy” eyes presented in a consistently “non-human” form. The pictures are not random, either in their geographic positioning, or in their depictions of detail. And in almost every instance they sit alongside equally enigmatic carvings of other well-defined motifs, all chronicled through cross cultural comparison, and now posing a grand mystery yet to be unraveled by rock art specialists. When seen from a larger perspective, three independent lines of evidence – galactic structure, plasma experiments, and images carved on stone – converge to tell the same story.